From the city of Evanston, Illinois, where the Temperance movement originates, comes a craft distillery that put a stop to long-standing dry laws in these parts. Situated in the backside alley of a former chop shop, Paul Hletko and his skilled team are crafting the finest spirits made from Corn, Rye and Barley. The distillery’s single purpose is to bring the best products made from the best grains, perfectly matured and finished under one roof. Now to give you a brief backstory. In the 19th century a woman named Francis Elizabeth Willard was elected President of the Chicago Christian Temperance Movement. She embarked on a decade-long crusade to prohibit alcohol in the US, and had succeeded. Mr. Hletko worked hard and lobbied against the law, and eventually, made it go away. Ironically, and hilariously, he’s named his craft spirits after Francis (FEW are the initials of her name). Bold move for sure. 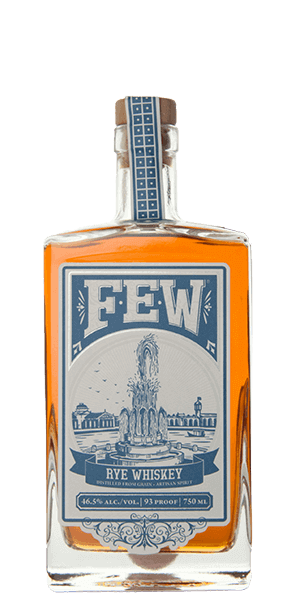 FEW Rye Whiskey is aged in air dried oak barrels and is a meld of Rye, Corn and Malt in its mash. To be particular, 70% Rye, 20% corn and the rest consists of malted Barley. This makes for an exceptionally good Rye Whiskey, one that its creators are proud enough to call “the renaissance of Rye”. Young, and fierce yet really smooth around the corners. An impressive Whiskey from a genuine distillery with a bright future. What does Few Rye Whiskey taste like? The Flavour Spiral™ shows the most common flavours that you'll taste in Few Rye Whiskey and gives you a chance to have a taste of it before actually tasting it. Caramel with an orange tint. The prevalent Rye succeeded by complexion of Vanilla, Brown Sugar, Cinnamon and Wood. Some hints of Butterscotch, Citrus Zest and Pepper are also present. A kickin’ and vivid flavor that starts with buttery Rye, Raw grains, Fruits and some Honey. In between some Citrus, Baking Spices and a bit of Wood is also felt. Long and slow pepper finish. Really enjoyed this one. Opened with rye spiciness undercut by maltiness, then lots of vanilla with some honey and caramel, and then a surprising finish of baking spice. The hard rye hit at the beginning might turn off some, but the malt sweetness smoothed it out nicely and the rest of the flavor progression was a fun ride. Surprisingly good. Very long finish, but not harsh. Nice. Little burn on front. Vanilla. Not overpowering. Very surprising spicy finish. Perfect sipping while watching the baseball game. Not a big rye drinker but this was very pleasant all around. Nice aroma. Interesting taste, better than the other ryes I have had. It was okay but not a fan of rye whiskey. I don’t get the malted barley but solid honey and caramel. Nice rye spice. Nose and finish could use more. I've always been a Scotch drinker so Rye Whiskey is new to me. The smell was really nice, sweet with caramel and barely. I really liked the sweeet, spicy flavor, but the finish tasted like a surgical glove to me. As this is my first Rye, I will have to explore further to determine my likes and dislikes. Initially a medicine-like taste to my tongue. The spicy component saves the drink somewhat. Yumm. Love the warm spicy taste. Very solid. Cant go wrong. May not be your favorite, however, you probably wont be upset either. Easy to drink, dry and leaves a nice spicy finish. Great flavor. Mildly spicy to me. Very easy drinking rye. Hints of a single malt. Spicy. Smooth. Nice sweet honey scent. The malted barely and caramel flavors make it pleasant to drink. Great to pair with dried fruit. Rather spicy. Very rich tastes and interesting flavors. Spicy and sweet, just a little bit. A little harsh to sip but I mixed it up into a Sazerac and it was really good. That's a really nice rye. It's mild with a rich mouthfeel and the rye sneaks up on you at the end. It might not be for a real rye head, but it's a good transitional brew. For me a rye is usually a mixer but I always like to try them first. This one has a great nose, and an interesting start, but left me with the taste of rubber band for the finish. Best of batch in the introductory box. Like a good night in Chicago- cool, sophisticated, but friendly. I really am new to rye whiskey. Actually liked his one a little better with a splash of water. I had a hard time tasting many of the flavors. Definitely had a peppery finish though. I’ll keep an open mind on Rye for now. I think this was very good. The nose is awesome and the taste is smooth and malty. Smooth with both sweet and spicy notes. Will be buying a bottle. I'm not a whiskey fan, but I loved this. Very smooth with the hint of sweetness and a burn that lasts just long enough. Never had rye before, this was OK, I guess. Nice rye nose and flavor. Good spice with some licorice. Finish was warm and spicy. Love that spicy end note. Lots of pepper. A definite winner for me. Smooth with a little spice to it. I really liked it. Spicy with orange, chocolate and anise. Its a nice, enjoyable rye, but not my favorite. Rich caramel aroma. When first hits tongue the honey comes through with the pepper and fruits flavor to finish. Real sweet and spice. I only did neat and very little at a time. Delicious. This was first Rye whiskey and I liked it! I liked it on the rocks. It was fine. Wouldn’t kick it out of bed, but might not invite it for breakfast. Not my favorite rye but not bad! There are better examples for a better price out there for the price point I will probably pass on this one. Spice tends to overpower the other flavors. Really heavy on the spicy front, was alright once mixed with water. Ok, a little hot for me, couldn't enjoy the faint hint of honey- vanilla, maybe black licorice. Never had rye before, but I kind of liked the maltiness of it. Also quite smooth. Wonderfully spicy and foreword—preferred this one on the rocks with a splash of branch water. This is my favorite rye! The balance of flavors is magical, just the right amount of sweet, strong rye, smooth and lingering after. I like it both straight and in a Manhattan. I loved it, but it definitely is only for certain tongues. I love intensely complex and bold types of flavor, black licorice, for example, is a big flavor coming to me from this one. If you want a good bite surrounded by a hint of smoothness with a balanced spice burn at the end, try it. If you're looking for aged and smooth/easy drinking, maybe not for you. Definite notes of honey and vanilla and a spicy finish. A little immature needs some age to round it out. Get the rye aroma and flavor like you would expect from a rye. There is some malty notes as well. Spice hits you in the flavor and ends with a sweetness. Reminds me of fruit but cant put my finger on it. Good Rye. A bit dry for my taste. Great rye. Nice spice, grainy/fruity mix. So good. The honey and caramel round it out nicely. A lot of flavor !! Fantastic rye ! A bit underwhelming for the price point. Not a bad rye though. A bit “minererally” that is what threw me of and the finish is a bit short. Smooth to start and pepper on the end. Definitely drink on the rocks. I liked it a lot. Good to drink on the rocks. Got some spicy notes at the start and lingering through the finish. Bold flavor with some hints of honey - and, of course, rye. Not bad, but probably wouldn't buy it. Prefer things more on the smoother side. Solid rye. Love the honey notes. A little pricey for what it is though. Really bold flavor very peppered flavor. Definitely tasted the pepper, spicy, and caramel flavors. Interesting taste, but not my favorite. Good. Strong flavor. Tastes and smells woody. For the price.. I can find a better tasting whiskey... but this is definitely a whiskey for someone who doesn’t like the sweetness of whiskey. Good rye. Would be good in Manhattans. Barley and a little sweet. So I saw a lot of people saying this one makes them realize they don’t like Rye. Well, it was the opposite for me. I thought I liked Rye and now I’m sure. Found it smooth and a hints of oak and spice without being spicy. Great overall taste. Not a fan at all. The rye in the aroma overpowers any notes of vanilla, brown sugar, or cinnamon. It is a smooth whiskey, but my pallet cannot pick up the flavor profile. It has a strong finish of pepper and citrus. Not worth a second dram. Not my favorite. Weak rye flavor, harsh pepper and citrus notes. Finish is very medicine/antiseptic like and lingers. Aroma: Rye and brown sugar Flavor: Rye and honey with a spicy finish Decent for sipping but missing a little something which keeps it from being a favorite. Probably best for manhattans; not enough rye to stand up to a sazerac. Great whiskey. Doesn't represent a Rye well. So smooth. Citrusy and spicy. Easy drinking. Good hanging out on the couch spirit. Not smooth, pretty spicy. Nice flavor but not exactly enjoyable. Smells like turpentine, nice caramel and dry finish. Would love to try this in a Manhattan. Came in my welcome basket. The harshest of the welcome box. Better on the rocks to take the edge off. The pepper taste is prominent without being overwhelming. Not bad. The description and flavor spiral is spot-on. Definitely an enjoyable rye to sit back and sip on a drab after dinner. I enjoy how it seems to tip-in with honey and malted barley before hitting you with the pepper and spice before finishing with a hint of a buttery sweetness that hangs around for a bit. Definitely one to consider adding to the bar. Have not gone deep into the Midwest well just yet, but this was pretty good. My experience is mostly with Kentucky Ryes. Could have had a little more noteable finish, but overall..I'd say i'm a fan. The dominant flavor in this is the pepper and spice. I like it as a novelty but it is not something I would seek out for a full bottle. Just average. Came in one of the initial tasting casks. Kind of a rough taste and finish. Was cautious with an Illinois whiskey but since much of the pre-prohibition rotgut came from there via the cheap whiskey baron Greenhut (who killed better distilleries) I figured what the heck, give it a “shot”. Actually given the good reviews and the sample in my taster box, I bought a bottle. Being a big rye fan, I love it. Very earthy sweetness behind the rye spice and heat, it reminds me of the earthy smell of wet sasanquas (a flower in the Camellia family here in Louisiana), which is my favorite smeoon the planet. Nose is pure earthiness and floral. Pallete is hints of cinnamon and other Christmas spices with some cayenne heat. Will buy another bottle when this one runs dry since you can’t get this yet in the original American whiskey market- New Orleans. Not a rye drinker normally, and I’m not sure I’ll ever develop a real taste for it. That being said, I can still recognize a good quality spirit, and this is definitely good. It has a great mouth feel initially, very silky smooth, and a great flavor of honey and spice. Cinnamon wasn’t on the flavor spiral, but to me if you made red hots out of honey, that would be a pretty good comparison. It ends with a nice tingly caramel finish. The smell is a bit of a deterrent at first- like paint primer. But the taste oh my goodness. Buttery. No bite. Smooth. Love the corn flavor. I’m not normally a fan of Ryes but this whiskey is exceptionally smooth with a great finish. Smoldering after-note. Pleasant, but not dynamic enough for me. Little more smokey than my pallet prefers, but still a very good drink. It has a sweet, Carmel taste that was quite enjoyable. Got a bottle after tasting. This is a sweet whiskey with a deep caramel tone, easy to drink with a little after bite. Nice place between smooth and harsh it’s neither. Very bold flavor, but smooth around the edges and great complexity in taste. Nice and smooth with spicy finish. Enjoyable with each sip. I have never really enjoyed Rye, and I’m sad to say this one wasn’t much different for me. Very bold, and for me didn’t spiral well. I think it would be a good mix but not neat. Didn't think I liked Rye before this. Distinct floral on the nose. Solid, juicy bourbon in the mouth. Definitely taste the dryness. Really nice overall. Would definitely purchase. Pure rye, fruity tone coming through with complexity on the back of the tongue. Moderately sweet and fairly smooth. Possible notes of vanilla? Nice and spicy, and it sticks with you. So glad this one wasn’t too malty; just enough earthy sweetness in the backdrop, with all the moxy and pepper up front. Held up to a few drops of water as well, as it blasts its spice out when given a drink without being clingy on the palate. Too much pepper. Can’t get past the aftertaste. Not a fan, but everyone has their preference. Rye whiskey isn’t for me. I had a difficult time distinguishing the flavors in this whiskey, but I did enjoy it. And I love the smell. It was smooth enough to sip. I've never really tried Rye whiskey before, but this one was good enough to open my eyes to the possibility. Good, strong rye. Plenty of nose and good spice. Loved the complexity of the flavors! Never tried a rye before. I was impressed. A fine rye. A bit too spicy for my palate. Nice rye. Light fruit and a spicy finish. We enjoyed this one. I’m guessing I’m not into Rye. I really like Rye, but this one just didn't sit well with me, I got the weirdest nose on this it smelled like a tire store... also got some honey, and play dough... the taste was VERY honey strong, and not much else. Given the choice I would take Bulleit ALL DAY LONG! Has a great aroma of vanilla and cinnamon. It's overall really spicy. It was a nice change of pace from the normal rye. Delicious rye sharpness and flavor, while nice and smooth. Great flavor. This tasted weirdly like home to me. Yes. Solid pick for the welcome box. Smooth rye, warm lingering aftertaste. Not really worth the price point but a pleasant drink. Smooth sweet rye whiskey, not really worth the price point, has a strong alcohol taste but the aftertaste is warm and long. Surprisingly smooth whiskey. I haven't been a fan of Rye Whisky but I did enjoy tasting this. I think it's the bit of sweetness from the honey that really smooths this whisky and makes it easy to drink. Vanilla nose and smooth drinking. Spicy from the rye but honey comes through. I'm pretty new to Ryes but I really liked this one! I enjoyed the spice and bold flavor. Eh - if I'm honest I'd have to say it smelled and taste a bit like rubbing alcohol. Not a lot of notable flavors jump out when tasting. Not my favorite, but thank you. A few drops of water did help me find more of the nuance of flavors. I appreciated the honey, but too much spice for me. This packs a wallop. It was a bit harsh for our taste. Spicy on the forefront with a sweet caramel finish. I'm not usually a rye guy (don't get me wrong, I'll drink it when offered) but this one could change my mind. If you like spiced rum or black pepper, you'll dig this. A decent rye, but suffers from too many spicy notes. Similar to their spicy bourbon but overpowering in the rye form. Way too spicy for me. Even with water it was too much. Might be good mixed wit hot cider. Very sweet aroma of caramel. Finish is rough probably due to the alcohol content. Leaves a burn in your throat. Have not sampled many rye whiskeys, but this one is a favorite for me. Loved the spiciness. Going to buy a bottle. Great flavor. Smooth with a good aftertaste. Really enjoyed it! Ranked 4th of 4 for both Jeremy and Jason. Would not buy ever. Not a huge fan of the rye, but if it's your thing, not bad. Good taste and great color. Never really liked rye whiskeys prior to tasting this one. Smooth, sweet and spicy. Might consider adding this to my home bar. Nice and spicy. I get some cedar which is interesting. A splash of water brings out the sweeter notes of fruit. Very good rye. Very good rye. Has a very nice spiciness to it without being unbearable. One of the best Rye whiskeys I’ve tried. Sweet for a rye. Like the spicy sweet mix. Has a little bite ... some sweetness, and a little smoke. Whoa pepper! Spicy in a way that would go well with a steak but a bit harsh on it's own. Good liquor but needs to have something to hug, other than your mouth alone. As rye whiskey goes it isn’t bad, but just over the top for my preference. Very sweet initial flavor followed by strong pepper spice. The vanilla aftertaste is great, but the spiciness turns me off to it. Still a decent whiskey though. I thought this was a great Rye. It has a nice flavor with a smooth finish. It isn’t a whiskey that I would drink often. It is, however, a whiskey that I would have occasionally, or when introducing someone to something new/different. Not too bad. Very smooth. Not a bad rye at all. If you’re new to them, you should start with this. More spice than I typically enjoy, but quite good. Sweet with notes of caramel. Spicy rye!! A tad harsh, but I enjoyed the complexity. Just beginning my appreciation for rye whiskeys. Love the nose on this with a strong rye aroma coupled with a hint of cinnamon. The rye continues to come through on the palate. Comes on spicy pretty quickly. Sweet nose like spiced cookies and a warm grain taste. Will definitely buy a bottle of this. Tasteful rye. It has a raw grain taste initially followed by a spicy astringency which lingers and finally finishes with a warm caramel flavor. A rye from Illinois. Nose: Tons of spice. Clove. A touch of anise. A whole lot of black pepper. Some dried fruit underneath. Some must buried underneath; takes some digging to get to. Palate: Rye, obviously. Still heavy on the spice. More clove than black pepper. Some tannins. A touch of cinnamon apple. Finish: Lasts a long time. It's a good, rye finish. Only reason it got 3 stars is because there was no anise flavor. I found this very rough and very spicy. Might go well with some kind of apple dessert, to counteract the spice. This is the best of the three in the tasting box. While a lover of whiskey, rye, and bourbons, I found this rye too hard to keep down. I am not a professional so I don't know the finer points of tasting, but as a person who likes to sit down and have a drink every once and a while, I will not be reaching for this one any time soon. As a huge rye whiskey fan I was disappointed with the corn blend which pulled away from the natural spicy component to rye. Seems as if they tried to compensate with pepper but it doesn’t give the same rounded and not overpowering complexity that rye gives. I can tell it’s craft and that they put a lot of love into this but I’ll pass. There’s also a level of flavor that’s been stripped out of this. Not enough head in the distillation or maybe they charcoal filtered it? That said the backstory to this whiskey is unrivaled and I’ll try more of their offerings in the future. Very nice! Pine and lilac nose. Full flavor, warm, caramel, spice. As a fan of rye whiskey, I was impressed with the flavor. Sweet at the beginning with a fine peppery finish. Not a fan, to sweet at first and finishes like cheap booze. Sweet at the beginning, smooth, and a nice short finish; with many flavors. All I had was a sampler; so I didn’t have enough to figure out the individual flavors. I will definitely think about purchasing this one. Sweet up front; little bit of spice on the back; very smooth. Enjoyed the flavor profile of this rye. Well rounded and a great finish. Syrupy, lots of honey flavor combined with traditional spicy rye. Not sure I like this combo. Good for sipping if your in the mood. I could see it as a great fireside whiskey on a cold night. Great flavor. Smooth and balanced. Not too sweet with a good rye feel to it. Was smooth however a bit strong. But the higher alcohol didn’t ruin any of the flavor. Tried it neat and with a little ice. Liked it much better with a little ice. I do get the honey and caramel. Decent rye. I liked it much better than WhistlePig. Have to say this is one of the better rye whiskeys I’ve had. Rye taste prevalent then a honey sweetness. Long spicey finish. Solid rye but overpriced for what one gets. Rye holds up for sure but something else felt deterring to me. I could work more with this but don't think it would be a regular since I find more enjoyment in less expensive variants. I believe worth a taste at least and possibly more to get better acquainted. Became more acquainted with this as I sampled it against Bulleit, Rittenhouse and Whistle Pig. Have to say, I find more to appreciate and respect after the first taste - with certain complexity that I'm sure was carefully crafted. Think I still stand by the 7 but could lean closer to an 8 (just a sharp price to pay that keeps me from a sure 8). I did not think I would like a rye but this was great! This was awesome in a mule with a small lemon wedge. Typically I am a bourbon drinker but now I will have to explore other ryes. Good for a rye but I’m not a huge Rye drinker so it was just ok for me. First Rye tasting. Really enjoyed this. The honey and barley really stood out. Nice pour. Good flavor and sweet aromatic. Strong notes of malted barley. Enjoyed it best with a bit of water added. Good introduction to rye and looking forward to trying others. Really smooth and great flavor. I truly enjoyed it's smoothness on the palate. And it is flavorful, but retains a very clean taste. No bitterness afterward. Very nice spirit indeed. Decent, but not great. If I rated this after the first taste, it would have probably been a 5, but the flavors became more apparent as the ice ball melted. Overall, it was a good drink, but I wouldn't carry a bottle in my bar. Smooth as silk, great taste. For Rye, this was fairly flavorful. That malt was definitely present, also a fruity almost pear flavor to me. As rye goes, I liked it. This went right up my nose. But after that, it was nice. Nose of citrus peel, mellow rye spice, pumpkin pie. On the palate, there is promise: toasted marshmallow, orange oil, very comforting, very nice. An easy dram. The finish is a bit of a letdown. The flavors dissipate pleasantly enough, but there’s no real there there. When it’s over it’s over, and it doesn’t impart any mystery that would invite you back again and again. Not bad for a rye. Bready and grainy flavors. Didn't taste pickle, so that's nice. This one was worth the intro kit. Loved the malt, smooth with great caramel and honey supports. I guess I just don’t like ryes too much. This has good flavor though. Quite a bite and a bit of a harsh finish. Ice balances it out but at this price point, I’m not a fan. Spicy, hot and the Rye stands out A LOT! In the right cocktail it could be incredible, but not my cup of tea. Interesting story behind the bottle though! Not as fruity as some other ryes I’ve tried, but I did like the aftertaste. Very smooth. Good nose. I love this whiskey! So I floral and easy to drink. Can't get enough. This is an absolutely delicious rye, with multi layered notes of honey, oak, vanilla and strong pepper. A gorgeously full and complex whiskey. I got this in my sample box and am just ordering a full bottle. This is an interesting one. The nose carries sweetness, honey, and orange through to the palate. The finish reminds you that you’re drinking a rye - the sweetness fades, allowing the peppery spice to come through. I feel that the finish is missing something, but I can’t quite put my finger on it. Very tangy rye, enjoyed quite a bit. The only other Rye Whiskey I have had is Pendleton, which I enjoy. This one is just not for me. I received it in the welcome box. The aroma I got was a strong rye, cinnamon and brown sugar smell. The flavor was very strong on rye and honey. The rye is just too much for me. This was my first rye. Not bad, but I do like a good funk in my spirits, and this one didn't meet my expectations of funkiness, I suppose. Smooth taste. Great addition to any bar. Not a huge fan of this rye whiskey. As many have pointed out, it does have an interesting spiciness to it. It's a bit harsher then I care for and I feel like for the price, there are better options. Very nice surprise. Lots of flavor, unique, assertive without be overpowering. surprisingly sweet for a rye, with a strong aroma of the mash. Water seems to diminish the experience with this one - brought out more acrid qualities. Nice, rye appropriate spice. Not too hot. Come from sampler. I wasnt sure if I cared for it at first taste but I kept craving more the more I tried. I am going to pick up a bottle and hope I continue to enjoy. I don’t think I have ever truly described a drink as truly spicy before in the same way food can be spicy, but this Rye is exactly that. The Flavors of Rye, Pepper, and Of course the ever present Spicy flavor dominate this drink. Yet they are not too overpowering, there is a sweetness that rounds out this drink and make for a long and surprisingly smooth finish. These flavors make it extremely enjoyable if you like spicy foods in my opinion. This drink may not be a good day to day spirit but it is certainly an experience that I would like to share and revisit on a regular basis. It was one of a sampler. I didn't like it. I need to sample more rye but I have a feeling I won't like rye. Unlike so many whiskies, very sweet and juicy but the finish is like a dry spicy pepper. Smelled a bit like tobacco with the more typical vanilla and honey. Nope. Just nope. Unless you like a strong drink, not for you. Really liked this. A little spicy. A little caramel, though lighter than a scotch. East to drink. The first rye I think I would buy again. Very smooth start with notes of orange and honey. Very easy drinking, add to your list. Definite rye notes balanced with a smooth, caramel-y flavor. Yum. A fave at this year's Swingfest golf outing. This was really good. Smooth and packed with flavor. Nice body, flavor depth, and strength of cask! An unapologetic drink. Strong, intense, but subtle. Rye fans who enjoy something on the harsher side should give Few a look. The nose is incredible, with spicy, woody, and vanilla notes. The taste matches the nose, with a long peppery and fruity finish. This is definitely a good go-to rye. Very nice. Nice sipping. Nice! I'm not sure what happened between now and the last time I tried this, but I'm finding a very enjoyable caramel-like mouthfeel. (Btw I hate the term mouthfeel). It's still as fiery as I recalled, but I guess I'm just more predisposed to a warmth in the ribs tonight. Wish I had more! I really wanted to like this Rye, but it was a bit too harsh for me. Don’t get me wrong, I’d drink it, but it wouldn’t be a first option. It’s ok. It’s too hot for me. I diluted it some and it is still too hot. Smooth and strong with a clean finish. Warms all the way down. This is my first experience with rye whiskey so I don't really know what it is supposed to be like. If this is a better example then I probably will not be a fan of it. To hot and spicy -too much like moonshine. If that is what it is supposed to be, that's cool, it just isn't for me. tasted the rye flavors and lots of spice. Not a big fan of ryes (yet) but I think over time they will grow on me. It was the perfect mix. I am a new rye whiskey fan! my first rye, got this in the welcome box. i loved it! Carmely rye richness! Kick on the finish. My new favorite for rye cocktails...Honestly 5 stars on ice alone, 8 stars as a mixer. I can see why some people might like this but I do not. All I am tasting is rye and barley. wooooohhhhh this one was not for me. fire in the chest. Jasmine/floral, dried corn & caramel on the nose. Pepper & floral... DRY. Not bad, but not for sipping neat. I’m not much of a rye guy. This was high quality, but not my preferred flavors. Has a lot of pepper on the finish and taste a little rough to me. Much better ryes to be had at this price point. This is my first rye whiskey and it has a very peppery finish. Pretty smooth going down. I'm just getting into Ryes but this one is extremely flavorful. It is a little rough on the smell test but comes through on the taste with full flavor and slight smoothness. Nice rye - not as sweet as most and pretty smooth. Nice for a change. Not a fan of Rye however, this one isnt bad. Fairly smooth, not strong on the nose. Very strong black pepper at the end. I think the evidence is mounting for my preference for lower rye content in whiskey and bourbon. Seems like a always get the spicy after taste. Not as smooth as I would like. I can smell the sweetness and I taste the honey initially before the pepper and spice takes over. I love rye. I loved this bottle of rye. Not bad, The spiciness is the most dominate quality. It has a bit of zing that betrays it’s bland aroma. Aside from that, not much else to say. It’s certainly not a bad whisky, but not necessarily I’d want to buy. I thought this whiskey was remarkable for the price. It had a pleasant punch to it that was refreshing and was an attention grabber. Nice flavor and subtle bite, definitely one of the better ryes. Over priced for me, wouldn’t pay more than $50. Full bodied, bold, and spicy. Strong flavoring throughout with a little bite at the end. Love this! So smooth and great tasting! Full bodied. A bit sweeter than Whistle Pig, for reference. Very good. A little bit harsh up front, but it mellows out into a caramel and barley sweetness that is a true pleasure. First time tasting Few Rye Whiskey. Really enjoyed the carmel noise and the smooth finish. Will have a bottle in my bar soon. Not bad, nice pepper spicy finish. Sweet hints, nice evening sipping whiskey. Nice spice, with a caramel sweetness. The caramel and honey come through strong, making this a perfect match for late summer sipping. Spicier than I particularly care for, but the hints of vanilla and wood are quite nice on the nose. Smooth and easy to sip, but you still know you’re drinking a rye. I could drink this again. Not as bad as I was expecting my wife enjoyed it more then I did but I can see sipping on this before bed. Decent Rye Whiskey very little burn and can be sipped straight. A little pricey though for the quality. Lots of spices. Very smooth. We all loved the woody taste! Like drinking in a wood shop after cutting pine planks. Some of us weren’t a fan of the buttery rye. The malted barley and rye were a little strong to start. As I kept sipping it smooothed out nicely. The caramel and honey mixed well with the peppery finish. Solid rye with a good story. Not really what I anticipated. Strong on the barley and dry notes. The honey burst and spice is noticeable. Ditto on the slow long peppery taste. Mild & sweet to start, but finishes with that spicy rye bite. Super smooth - almost can’t taste the rye. More vanilla than caramel. Mild aroma. Dry-Not too sweet just subtle pear/fruitiness. Spicy. Smooth, with nutty and caramel notes. Spices, licorice aftertaste. Dates or dried fruity taste. Rye is present. A bit harsh. Some nice complex flavors. One of the better ryes I've tried. Really enjoyed the flavor profile. I’m am not a big fan ryes, but it was one of the better ones I’ve had. I'm personally a rye whiskey drinker. Received this as a sample included in my welcome kit, I enjoyed the spicy flavors with each taste. This was a sample included in my welcome kit. I've never been much for rye whisky and this sample was a bit abusive on the senses until opened up with a 1/.5 slash of room temperature water. This really brings out the wood, caramel, and cinnamon notes. Pleasant enough, would sip again. Not a long going on here. Almost no nose to speak of. Almost a mix of isopropyl and cracked black pepper. If I were to drink this blindfolded I don't know that I would know I had just been given whiskey. I believe this is the second sample I've had from this distillery and both were underwhelming. They may be better suited for hospital cleaning supplies. Definitely, not for me. I did not find this friendly, but I'm not a huge rye fan. It was an extremely spicy heat, with a touch of black licorice. It might be okay with a mixer, but nothing I want to drink neat. This is a very good rye whiskey. Smooth sweet notes to the nose. As for the tasty spicy with a nice bite and a little heat to the tongue. Very good rye.!!! Can't understand most of the ratings. This was SMOOTH and tasty. My favorite Rye to date. Good flavor. Smooth with little bite. Received this in the welcome kit. Simply not a fan of the burning taste of Rye. Don’t hold my vote against it. Decent drink with caramel/honey aftertaste. Simple rye whiskey. Not as smooth as some others, with a reasonable aftertaste. first sip very spicy almost burn with little flavor. went back to it after a few and flavor was spice/burn with rough edges almost like an unrefined old time drink. Smooth at first leading to a spicy finish. FEW Rye has a lot of character and distinctive flavor. For the suprisingly gentle nose you wouldn't expect the explosion of wheat and rye on the palate. Open this up with a proper ice ball or a splash of chilled water and you can really sink into the other flavors. Bite is present but not overwhelming. Not a huge rye fan but this has opened my eyes to the possibilities! I didn’t particularly care for this one, the taste was a bit to bright and the end back end was a little unusual. Not bad for my first Rye, a little harsh but turned out really nice after a splash of water to open it more. Very good. The caramel and spiciness paired nicely and the finish was very short. I could drink this on the rocks all day. Very good, I can actually taste the citrus and caramel. Class act. I didn't find this spicy, I just found it intense, with odd tastes that reminded me of floor polish. Not a fan, I'm afraid. A kick in’ and vivid flavor, A good savory rye. No overt sweetness. Nice full Rye with a lot of caramel and spice. A good savory rye. No overt sweetness but plenty of spice and maltiness. Tasted cinnamon, rich sweetness, and a smoothness that surprised for Rye. Nice full Rye with a lot of caramel and spice. Nice, smooth. Mellow finish, hints of caramel. My favorite of the welcome box. This is the first rye I've tried, but I loved the spice. Love it ! Very smooth and flavorful. A little harsh on the first sip, but a smoother finish. I prefer other rye’s over this one. I put this taster up against some of the best in my collection and was shocked it came out on top. I am a rye fan though every time, so I suppose it makes sense. New to trying Rye Whiskey and this is only my second brand tasted. Much better experience than my first (which literally tasted like liquid rye bread). However still not sold on this style of whiskey. Decent drink. Good caramel/honey aftertaste. Smooth. That's the best word to describe this Rye. No single ingredient really grabbed me. That might be a good thing or bad thing to each person, but it all translates to a simple and smooth experience. Im not much of a Rye drinker. The smoothness was nice. The spice was comfortable and It has some pretty long legs. I dont think I will be adding this to my bar however. As far as ryes go this is good, not great. The aftertaste was a bit too much grain. Not a huge fan of Rye myself but this one is a winner. Dry and spicy with pretty long legs. Finishes strong and not as aromatic as I anticipated. Very harsh to me, with a lot of forward flavor being grains. Probably would go nicely in a cocktail, but did not prefer it neat. I enjoy the peppery finish. After the obvious rye and grain, I picked up a lot of dry, spicy wood— maybe sandalwood or cedar?— and a fruity pepper— like black currants. Like the subtleness of this drink. Not very strong flavors in either direction, and none of that warm feeling inside the esophagus as it goes down. Very drinkable, but don’t know if I’d set out to purchase it, maybe on a good sale I would. It's not the worst Rye I've had, but the spice makes it hard to enjoy. Definitely not something I'd order a second of. The nose has floral notes with hints of lemon zest and orange peel. The taste is very one note. It has a classic rye taste, but it doesn't really go anywhere. Pretty boring. Tasted caramel, apricot and nosed/finished ginger. Dry and finished quick. I would repeat this bottles performance. My first rye! Great experience. Spicy, smooth, and delicious. Not my favorite but good overall flavor. Have never been much of a rye fan so my expectations were not high. I was pleasantly surprised that, like other ryes, I didn't want to make a face and just hand it back. I can't say that it changed my mind about adding rye to my cabinet but it was a nice surprise. I still prefer my rye in bread and humor (pun intended). Definitely dry and spicy. Would make a great cocktail! We were very surprised by this Dram not expecting this to be a rye, this is rye had slow legs tobacco smell, cinnamon, wood vanilla smell. On the palate black pepper Carmel, vanilla, honey coffee cake with brown sugar. keeping in mind we were blind tasting it going in not knowing which dram we were trying. This rye surprised us it had a very punchy kick but the layers of flavor and notes it brought. very high on our scoring!! we will be adding it to home bar eventually. I thought of a red velvet couch in a Smokey room when I smelled it...but I had no problem sitting on that couch. The best of the three in the tasting category. I wanted to drink more but I am saving some for my dad to try. That said I will buy a bottle in the future cause it is quite good. This was too spicy for my taste. Initial bite is spicy, but smooths out by the time you swallow. The initial touch makes you think it’s going to punch you in the face, but it doesn’t. Coats your mouth like a nice cigar. straight it has a very strong hit right off the bat, but finishing notes were nice. was perfect mixed with dr. pepper oddly enough. Really liked the first taste on the lips, soft and sweet. The spicy aftertaste took a minute to get used to but I enjoyed it. Not too impressed. Tasted fine but probably wouldn’t not seek it out. Normally for me Rye is for mixing in a Manhattan as the flavors for me don’t stand up on their own enough for straight drinks. This one, however, had a strong cinnamon flavor at first sip sliding into a caramel smoothness and ending with a bit of tingle on the tip of my tongue. The second sip started off with that familiar caramel smoothness and then suddenly surged into a wave of vanilla. Overall it has a decent balance of sweetness and spice. One of my favorite new Ryes. I’m partial to Bourbon, but this Rye was smooth. Strong rye and pepper upfront with a softer finish. Light caramel sweet smell, long legs, spicy peppery taste. Lovely flavors and somehow not heavy. Best Rye I have tried. Full mouthfeel, caramel-honey flavor, sweet aroma and long spicy finish. This has a lot of flavor notes like blantons, but with a little more spice. Unique flavor; outside my general comfort zone. Husband says “first sip reminds me of knob creek but smoother”. Too spiced, reminds me a bit of a rum. Not huge on Rye normally, and when drank straight the spice and barley was a bit much. But then I added a splash of water and it opened up, enjoyed if after that. Solid drink, while not my cup of tea, it is a solid rye whisky. I really enjoyed this! Great flavor! Faint hints of honey & caramel, heavy one the barley. Spicy rye whiskey, pretty tasty overall. Would like to sample more. Honeysuckling sweet good! Easy drinking! Nose- 7.00 Taste - 5.00 Aftertaste - 3.00 Overall - 4.60 Too peppery/spicy for my tastes. Tried this on two occasions. Loved it the first time, could take it or leave it the second. Great balance of peppery spice and a wonderful P.X. sherry sweetness. Lots of the rye in the bouquet, maybe too much. Also vanilla and honey. Could be smoother, but you don't mind the bite when the sherry shows up. I really wanted to like this, but it was just a little too overpowering. Maybe with a dash of water to mellow it out? Never was one for Rye whiskeys, but this one is an exception. Love the back story behind it as well. For the non-Rye crew out there, give this one a shot. Well worth it. Not a fan of Rye whiskeys, but this was a pleasant surprise. Spicy peaks mellowed out some of the Rye on my palate, and let me enjoy this Whiskey more so than some of its other Rye compatriots. The smooth caramel and honey keeps me coming back for more. Not a huge rye whiskey fan and neat it resembles your standard rye. However, chilled it’s a very smooth whiskey without too much caramel or honey sweetness. Very sweet tasting - honey notes. Ok for a tasting probably wouldn’t go for the bottle. A little sweet and lots of heat on the back end. Beautiful! My first rye, and I am will say it was quite smooth but very spicy. Has a bit of a bite and the spice holds on for a few moments. Maybe after a few more ryes and experience with them i might get to enjoy this more. Nevertheless, this was good but not what I consider great. I really liked this. It was slightly sweet and quite smooth. My first taste of Rye. I haven’t experienced many ryes but out of what I have had this has definitely been my favorite. I get spice and fruit with a strong rye/malt flavor. It oddly smells like soy sauce to me. The spice flavor lingers for a while after the sip. I am not very experienced with rye whiskey but I would rate this one ok but nothing spectacular. Generally I am not a fan of ryes. Usually to much of a spicy bite for my liking. This still has a bit of sweet with a light spice as well. Better than I expected. This was my introduction to Rye Whiskey. All in all, enjoyable. It was an interesting blend of dark brown sugar and malted barley flavours with notes of bitter orange peel, black pepper, and other spices. Thick, almost syrupy mouthfeel with slight alcohol after-taste. I could not get into this spirit at all; it was very crass to my palate as if it was spicy. Even after trying to mix it, the kickback rendered me no favors. Usually do not care for ryes, but since the previous one I tried (can't remember the name), this one may change my mind. Like the pepper aspect, but certainly enjoyed it. May change my mind about trying ryes. I’m not a bourbon expert, but typically prefer ryes and this did not disappoint. I haven’t met a Rye Whiskey I didn’t like and this was no exception. Slightly dryer finish but still enjoyable. Muted flavor; flawed, chemical aftertaste. I didn’t think there was enough depth of flavor. Tasted almost tinny. Lacked flavor outside harsh chemical taste with a small citrus back note. Very lemon forward, with a nice pepper following after, Very bright. Pretty average rye. Thought the spice notes were a bit overpowering, tasted better when dropping in a cube. Tasted green apple on the finish. Not likely to revisit. It was way too sweet. It had a chemical after taste that I didn’t enjoy. A good Rye Whiskey. Could pick up on some citrus, vanilla, and butterscotch with some pepper. Great on the nose. Definitely got the pepper. A smooth drinking rye. It’s definitely a different one, not too harsh but not one I’d choose for my shelf. Nose: Pepper, cinnamon, spices, cardamom, rye/grasses develops honey, citrus, caramel. Taste: Cinnamon, caramel, spices, honey; muted floral/rose notes coming through. Quite hot bottled at 46.5%. This one was not for me drinking it neat. There was an off taste. I generally like ryes, however as a sipping kind of drinker I was not impressed. The rye was good but not straight in my opinion. Mixed however it is phenomenal in place of jack or Jim. I’m not, as of yet, very familiar with ryes. I generally liked this one. There was a little too much of a bite for my liking, but I did enjoy some of the other flavors to come through. Never tried a rye before have to say i enjoyed this quite a lot. This was in my welcome pack and it was my first tasting and I must say I am glad that I joined this club. It is going to be money well spent. That said, I enjoyed the rye. I found it to be pretty smooth for a young rye. This was my first Rye whiskey. It was a bit too peppery for my taste. Part of my welcome pack. I enjoy a decent rye, especially in an old fashioned. Interesting nose of grass and heavy rye, oak, almost ripe Granny Smith apple. Palate of anise typical of rye, spicy, earthy grass and oak. Dry, short finish says it’s clearly young Far from other rye I’ve had previously (Michters, Templeton and even Bulleit) Not great neat but passable in an old fashioned. I found this to be passable. I'm not typically a fan of ryes, so my ambivalent response to this is to be expected. Smooth rich flavor. A little bit of bite. Complex with many flavors, peppery finish. While I’ve had better Ryes, this one was good. Nice going down a little to much for me but some of my peoples like it. More of someone sitting around the fire pit drinking and talking. Didn't really like this at first, but it seemed to tasted better after the first couple of tries. Still not a go-to for me though. Solid rye whiskey. Very smooth with lots of fruity spiciness and grain flavors. I was surprised in a pleasant way by this drink, I thought of the tasters in my welcome box it would be my least liked but it was -by far- my favorite. The peppery spice was particularly delicious and I've added a bottle to my next shopping list. I am not a big Rye drinker but for a Rye I found this one to be smooth with a nice bite at the end. Excellent finish, the spicy kick from the rye wasn’t as overpowering as others. My all time favourite, I’ve yet to try a lot of spirits on the market but this is leading so far... perfect drink with BBQ meats. Nice alone. Nice with coke. Spiced popcorn. Barley and rye graininess really hit home with a good dose of black pepper burn. Caramel and honey come through as undertones. Bone dry on the finish. This one is good, but not great for my palate. Just not a Rye guy, wanted to cut it with some Ginger Ale. Just ok. I liked it better than I would anything with eye finish. Disclaimer: I'm not very versed in ryes! Great flavors of barley and rye, but the overall flavor profile leaves much to be desired. I think the spiciness and sharper characteristics comes on too strong in trying to compensate for its sweetness. I can tell they are putting in great effort to craft a great rye here, so I am excited to see how they improve in the coming years. This would definitely be an interesting one for seasoned rye fans since it has a lot of character. Lots of burn / or Illinois hug, very thin spirit not much body that I would expect with such a strong finish. Has the spirit of a wheat-ed spirit vs rye. Smooth rye, mild pepper finish on the top of the tongue. Enjoy the initial bite on the back of my throat and the extended vanilla finish. The spice doesn't dominate the flavor, while still having a little bit of burn. This was relatively smooth for a younger rye. Liked it a lot. FEW people will like this. Thin flavor with plenty of burn. Not a Rye fan but this one is really good! I'm new to rye whiskey but this FEW is fantastic! Great complex flavor (that I still can't quite put my finger on!) that is just plain pleasant to drink! I'm a Scotch guy and really like this! Best Rye I have had. Like the "burn" this gave me....just starting out tasting new whiskey and bourbon brands but liked this one. One of the better ryes I’ve had. Not overly spicy with some sweetness to it. Was indeed spicy and dry. Kind of made my teeth feel itchy (if that’s even a thing??). It was okay, but I passed the remainder to my neighbor. Fantastic whiskey but would likely use it as a mixer rather than to enjoy as a sipping whiskey. Heavy on the pepper in the tasting notes. Just so harsh that it i snot a sipper, needs to be mixed into a Manhattan or something where other flavors can take over. Smooth, floral, good mouthfeel, sweet. Me & my husband’s favorite of the intro tasting box. Very smooth, I liked the caramel tones. Sweet and spicy with a kick!! Love it! Warm and rich in color and flavor. I would add this as second runner up in my home arsenal. Very smooth without the bite! I love the flavor of this whiskey. It is smooth and still full of smokey notes. It is yummy!! You can smell some vanilla. It has a bite to it and is a little sharp. Has a longer, mellower finish, but still strong. Not overly impressed. A solid warmth with caramel at the drivers seat. Not usually a fan of ryes I was pleasantly surprised by Few this is one I’d keep in my home bar and offer to my guests Thumbs up! Loved this! Smooth and easy to drink. Delicious caramel flavor. Though overpriced at $57, Few Rye Whiskey is a good drink. Nice, rich caramel and honey flavor that I found pleasing. The finish was smooth with a hint of spice. Not too bad with a Cuban. I really enjoyed tasting this blind. I've never been a fan of ryes, but this is one that I would keep in my home bar. It surprised me how much I enjoyed it. Smooth but with a ton of flavor profile. Reminded me of some moonshine I bought when I was in Mississippi in the late 80's. I liked it for the memories, but I'm just not a rye drinker. Not a bad dram.. and a good sipping whisky. I was somewhat surprised having a blind sample. I've been wanting to try this for a while now but didn't have the chance. I would consider adding this to my private stock, however, I do feel there are a few better choices at this price point. But it's a solid choice to order when out for dinner with my wife. Loved the flavor of this Rye. It was very enjoyable, however I agree that it was bit monotone. The description provided for the aromatics, flavor, and finish are accurate. Unfortunately for me, the sweet components didn't blend well with the grain and pepper. Since I found the drinking experience unbalanced, I tried it with a little ginger ale. The sodapop smoothed out the flavors for me, but my husband said the ginger ale masked too many of the Rye's nuances and that he preferred it straight. Husband gives this whiskey six stars and would pay up to $40 for it. Honestly shocked at how much I enjoyed this! Love it. Very smooth finish. Not a huge rye fan but this whiskey was ok. Decent flavor throughout, with spiciness from start to finish. Not a complex profile, almost monotone. Butterscotch to the nose. Smooth spicy finish. Really enjoyable. I was surprised... liked this and did not think it fit my profile. Very easy to drink and a bit sweet (?) but it is balanced. Spicy right up front. Bold profile on the nose. Not something I would have tried outside the welcome box and I would have missed out. Enjoyable rye that captures some wood/earth notes. I liked this one so much I bought a bottle!! Not a Rye drinker! Bookers is like moonshine in comparison. Strong bite with a hard finish. Not really a Rye drinker. But it was as good as Bookers. Good flavor, but a bit of a bitter aftertaste. Never been much on Rye but this can change my mind. Been developing my taste for peated , unpeated, and caske finished whisky then tasted this rye. Th e difference in grain used was evident and not to my taste. Reminded me of grandmas dairy. I love the caramel finish. First taste off the tongue is strong and rough - inspires me to drink with some old friends outside by a campfire. Fun to drink, sippable in a fun setting. Wouldn't be my first dram to reach for celebrating by myself. There is a surprising amount of complexity to this Rye. Great everyday sipper! I don't drink Rye often so this was something new. I have little to compare it with. Lovely taste of honey and carmel. Nice honey aftertaste and a good balance of pepper. Not for sipping (too dry), but likely good in a cocktail. This was delicious for room temp sipping. Dry as a typical rye should be but still flavorful. I enjoyed it while tasting but probably would not buy a bottle for sipping. Easy to drink. Very sweet. Has a wonderful spicy aroma when served neat, more of a medicinal aroma when iced. Sweet taste, I could definitely pick up on the honey. I wish it had a little more body. Flavorful, however the longer it stayed in your glass it became to taste like a very pungent vinegar. Meh. Fine in a pinch, but not great. Wow, this one is rough. Very smooth with a hint of spice. Nice on the rocks or with some ginger. I was not a fan of this one. It was not very complex and not what I would want in a Scotch. I didn't even finish the vial. It’s rye in your face! But in a good way. Lotta spice, dry, with a pleasant finish. Wouldn’t describe it as smooth, but very drinkable. I enjoyed it. I liked the spice and even the botanical note mentioned by another reviewer. Great mix whiskey, my wife loved this for mixing. It was okay, if you like rye. I'm not a fan of this one. First attempt at tasting a Rye, so hard to judge. From what I remember after drinking the Scotch, it was smooth, but spicy. Can't get the taste of the Scotch out of my mouth. Drank it neat. Spice is overwhelming and the finish is botanical like a gin. Not a fan. I was prepared to not like this, but I was pleasantly surprised! Sweet and spicy! I’ll definitely pick up a bottle somewhere down the line. Really liked this. Finish was so nice. Tasty! I am not a big Rye fan but this was quite tasty. My go to Rye when drinking it is Bulliet Small Batch. This was good but not as good as the Bulleit. Not my personal favorite. Burned more than expected. I loved it! I thought it was a beautiful match. Whiskey finished by rye. Smooth and delightful. Not the biggest rye whiskey guy, it was good but I will sick with my bourbon. Good and true to flavor spiral. Malt on nose and spice on taste. Nose - Rye, lots of rye. Palate - Bold, spicy , Carmel on the front. With a medium burn. Finish - Butter cream with a small hint of oak. Not my favorite - dry with a hint of spice. I'm not a Rye guy, but this wasn't bad. It was actually better neat than with ice/water. I might try this again. Really enjoyed the change with this rye. Note the citrus right away. The finish is long and spicy. My wife preferred the Few over Breckinridge. Smoother than I anticipated with a hint of sweetness. I enjoyed it. I do enjoy a few rye's, but this wasn't one of my favorites. "rye" always throws me off, but this was a bit of a surprise to me. I found it smooth and easy to sip. Nose has prominent notes of molasses and butterscotch, with a touch of pepper. Flavors have the classic rye spiciness, along with grain husk, cloves, and lemon zest, leading to a long spicy finish with a touch of cedar wood notes underneath. Spicy (but not hot,) this is a solid rye whiskey that sips pretty well on it's own, but should really shine in cocktails. A bit harsh not my favorite. Nice! A little pepper and smooth. I think Few will be in my bar soon. The Breckenridge Bourbon was a truly amazing & outstanding sample. The Few Rye was ok, smoother with a different twang spice kick than some other ryes I've had. The Kilchoman Machir Bay Scotch ruined the experience. Its peaty disgusting flavor lingered in your mouth for hours making this sample as a whole fail to impress. The highlights are that I will buy a bottle of Breckenridge, but hard pass on doing another blind taste test. I was pleasantly surprised at how the easy it was to pick up on the rye and malted barley aromas and flavors. The spice lingered a bit long but other than that, it was my favorite of the sample pack. Not a bad nose and finish. Spices are well represented. Very enjoyable, great nose, love the spices. Not too hot. Added a few drops of water after the first few sips, opened it up slightly. Not a big fan of rye but very drinkable. A good, solid rye with some spicy character. Not to mention sweet. Overall, well balanced. Very smooth drink so I could leave on my tongue a little longer and get the full taste. Ended with a smoky touch which I enjoyed. The overall taste wasn't excellent. Has warm finish that I really like. It hits harts but finishes with a smooth burn. One of the better ryes I’ve had. This was fiery but finished very nicely. I would not say no if someone offered me a glass, but I am not sure if I will buy a bottle. I am not a rye whiskey drinker but if I could be if I continue to try different types. Very smooth with a light Rye taste and a buttery flavor. I would recommend trying if you like rye whiskey. You think it’s gonna smoke. But it smooths out. If you like Carmel and butterscotch, I got a lot of that in this rye. Lingering finish of sweetness. One of the better eyes I’ve tried. Got the rye and cinnamon first thing in the nose and palate, followed by the citrus. A great sipper, neat or in the rocks. I'm not a fan of Rye but I want to explore and havent had anything from Few. It smells good.. once I taste it, I get the Honey note up front and prominent. Pleasant. But then the Rye and pepper kicks in and I wish the sweetness would stick around longer. The spice lingers long after taking a sip. Dry alcohol. I'm still not a Rye fan but appreciate the experience. Solid rye, not too spicy, not too sweet, and mixes well. Smooth and spicy. I haven’t been a fan of Rye but this was compelling. I actually give it a 7.5... My wife and I liked the Rye just fine... better than fine... Our issue is we have a local distillery that’s as good if not better... and cheaper... But make no mistake... This is good schmit! Loved this unexpectedly! Generally I prefer bourbon, but now I wonder if I’ve ever actually had a good rye. Pleasantly spicy and sweet - very easy to sip. Will be adding to my bar! While not usually a fan of rye’s the nice blend of sweet and spicy in this has me second guessing myself. This could be a great base in some classic cocktails but also straight up isn’t as astringent as some of its competitors. I'm learning to appreciate Ryes. This one is not bad, but almost has an odd Rye flavor. I would drink again, but I don't care to purchase, especially for the price. Worth a try though. An ok bourbon but a little light on the flavor and color. I wouldn't consider it a top shelf brand but certainly not bottom shelf either. Very smooth, had a nice fragrance, not smokey at all. I enjoyed it! When you first try it you get the warm sweet spice flavors, it was pleasant. Spicy and a cleaner finish than the Breckenridge with more ABV. Surprisingly, my favorite out of the first tasting! I tend to not enjoy ryes, yet this was more than enjoyable—I’ll likely add this to my home bar collection. An enjoyable rye. Not overly spicy, with some caramel/oatmeal cookie notes. But as I'm more of a bourbon drinker I tend to enjoy the sweetness you get from bourbon with a rye accent rather than straight rye. But still enjoyed this. Very good! Strong taste of caramel with a touch of pepper. Tied for favorite of the welcome package. Very nice slightly sweet yet spicy. My inexperience with rye whiskey may be why I feel I would have gotten the same flavor from a bandaid. It also was smoky to me, a flavor that I avoid in whiskeys. Definitely may need to learn and understand rye better found it to be very harsh on the throat! Not a fan of whiskey, rye whiskey even less. Probably why I did not like this. Smooth finish, light crisp taste, not too strong. Nice rye, smooth, slightly sweet. Will buy a bottle of this. I’ve not tasted a lot of rye whiskeys. I thought I might like them better than this. I did not get a lot out of the flavor spiral. Hated it. Very unpleasant after taste. Pleasantly surprised by this one. Not a huge fan of rye in general but this one had good flavor & was smoother than I expected. Would recommend to my rye loving friends. I love my Rye’s!! This was a great sample will consider adding to my bar! Was OK. Maybe drink for a once-in-awhile occasion. NOVICE REVIEW: So I am normally a Jack Daniels guy, never really tried Rye Whiskey until I had some Copper Pony and Winchester. Didn't like either one of those for sure! FEW was not bad, I could drink it again. Much smoother that the ones listed above. Not sure I am a Rye Whiskey guy though. A pretty good Rye...not overpowering. More of a Bourbon guy, but this is a nice Whiskey. Caramel is immediately tasted. Whiskey is not my drink but I could drink this. I've never had a Rye that I liked (therefore, I've only had a few - pun intended), but this one was actually quite nice. In fact, I could see myself buying a bottle just to have on hand for guests that like Rye (or when I'm feeling adventurous). Loved this! I think ryes might be my favorite! very smooth. Almost too much so. Not enough character to get me excited. As for Ryes though I thought it was pretty solid. I generally don't much like Rye but this one is not normal. Wasn’t impressing. I like rye whisky but I’m glad I didn’t buy a bottle to try it. It would have been a waste. Not a good flavor. Not a good aftertaste. I don't drink rye on a regular basis but found this to really enjoyable. It balanced between a rye and bourbon. Great nose and mellow finish. I would consider buying a bottle. Great with a cigar. Excellent! Bought a bottle at my local liquor store immediately after. Great flavor, smooth, and well balanced. Definitely liked this one. The spiciness was great. I will be buying this again. Liked the mouthfeel and butteriness. Disliked the overtly malted barley taste. I generally enjoy Rye, but the harshness of this one drowned out any flavor profile it had, even with the addition of a little water. I could tell that a nice profile was there, and I think an extra year or two in the barrel would have made a big difference. Just too young for the flavors to come through. Not as good as my Whistle Pig. Nice to try something without the risk. Very enjoyable with just enough spice to let you know you are on the rye train. Pretty harsh, decent up front flavor. It was just okay. Pretty harsh at the start. Some nice back flavors. A bit too hot, spicy finish, and love the honey and caramel taste. A very strong up front burn that tickles the back of your throat, but a smooth finish. I personally am not a fan of such a strong start (as well as such a strong burn), but my boyfriend tried it and he likes the finish more than anything. Very smooth whiskey. I did not know I was a fan of rye before I tried this. Definitely going to order a bottle. ok. I guess, not much of a ray drinker. Very interesting for a rye. Only reason I didn’t go higher on the rating is because I’m used to most rye’s having more heavier body. If it would have had the flavor it currently has along with a heavier body, I feel the sky would be the limit for this tasty drink. Would be interested to try this in a Sazerac cocktail. Not bad, but not going to be one of my go-to favorites.